As far as the mast goes,you could build it hollow,but you may not want to. with so much weight down there,a heavier mast can make for a more relaxed roll, rather than a real "snappy" action that can be a real pain to live with. Hope you dont mind me chiming in there Bruce. Thanks Skaraborgcraft! The cutter looks great too!! Segue, A 34 based in Bermuda, is planked with Iroko. No problem at all to use hardwood.You can make em thinner. Keep in mind the vertical nails may be trickier to bore and set. It will be easier to pop a few through. no biggie. I personally like a thicker softwood boat, one also gets a little noise reduction and thermal insulation. I thought long ago that I would sell Woody and build a sporty 28, like the cutter above, but as I get older (59) , the ketch has come back into fondness. My mast is very heavy. Solid second growth df. Lulu's mast is laminated of old growth DF , and it is solid , just 8 inch planks set fore n aft, but it is quite a bit lighter than mine. Old growth being lighter in weight. This litlle frames on the interior photo (painted in white) are 'secondary frames' or the chainplates? Strip plank, edge-glued 1 1/8” iroko hull skin epoxy/glass coated on the outside and screwed and glued to massive 3” x 3” grown oak varnished frames at 24”c with 2 steamed oak timbers between. This type of construction and finish, although not entirely traditional, gives a very low maintenance hull. I hate to be the smelly one in this lovefest but my ladyfriend was rescued y the US Coastguard from a disabled Venus 40 something in the Atlantic. EDit, she says they were under bare poles for 36 hours and never rolled, so that is seaworthy, the steering broke and the alternator stopped charging. They were towed 300 miles at 9 or 10 knots. Last edited by Hwyl; 03-18-2013 at 04:50 PM. The alternator stopped working !! Always a problem with the Venus design . Thats probably why a few of them have sailed engineless.....saves that issue what with alternators being expensive! Congratulations to Gareth for finding the perfect woman. Sounds like a keeper to me. I think you are right John. Bruce, I'm crest fallen. I could barely get up this morning. Plans are in tatters. Last edited by keyhavenpotterer; 03-19-2013 at 12:05 PM. I guess it depends in comparison to what? In comparison to my Transatlantic 2 tonner, the V28 at 8-9 tons will definately have motion comfort.....its one of the reasons i was looking around for a heavier boat! The ballast ratios can be considered on the low side, but what ballast there is,is way down there and so a huge lever. An 8 ton boat is not going to react the same way as a 2 ton at sea and that difference will be more marked the further you go up the beufort scale. If i was going to give up terra-firma for a few years and go where the water is deep, V28 is my choice. It is a big big ocean.Slow boats get caught in the junk, we cannot out run it. 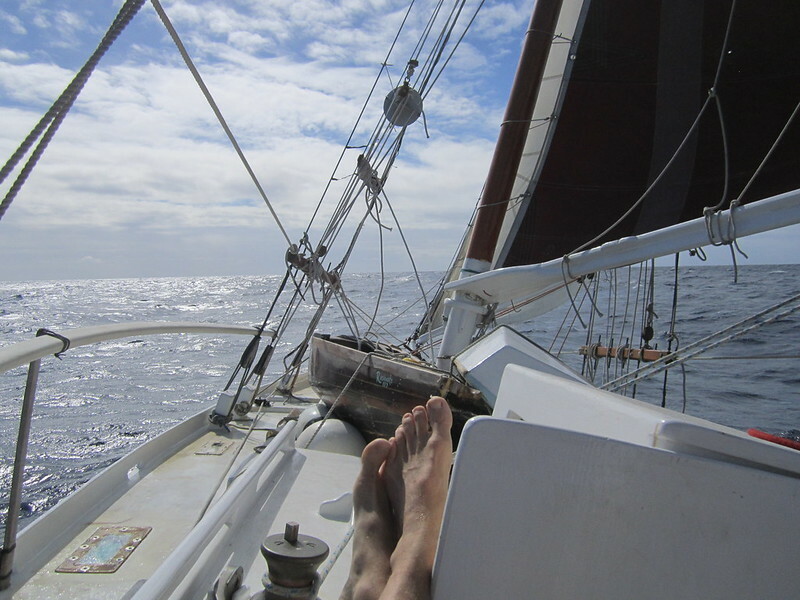 Ok, My last 400 mile, 4 day , singlehanded sail was beautiful. USVI to Grenada, not a drop of water on deck, nice motion. Cracked off on port tack. Game's no fun if you don't get a hit once in a while. Last edited by wizbang 13; 03-19-2013 at 10:57 AM. Great thread. I am interested in how you did your deck. You said you laid it all down and then cut the grooves a third of the thickness? Sheathing on top of it? How has it lasted? any leaks so far? I never sheathed the decks. They leaked a bunch when I took the roof off and the sun hit the boat. I was building so fast , I did the decks in the winter , the wood was not all dry and I was cocky and overconfident . These factors added up to a big mistake . I re sawed and re glued a lot of seams over time .By the time the boat was a year old , the fine cracking was about done. When I took her to Baja, there was more kerfing to do .Hand chiseling in tight spots. Luckily , it is not a complicated or time consuming job , just a little shocking to watch. These days , some years I might get 2 or 3 feet .Some years none . If I find a leak , I fix it . If I find any hairline crack , deck, hull , cabin side, anywhere , I get right on it . With a small paneling saw, It is quick and easy. So , an attempt to avoid sanding overhead backfired in a way , but now I have superior decks . In a do over , I would be more patient with drying the wood and glue the decks together , not retro glue them. And , Now I have a cool full face shield/mask , that makes working in a cloud of dust painless. Remember , it was cheaper to strip plank the decks than to but plywood at the time . I was asking because I have a carvel fishing boat with a caulked 2" thick ayc deck. It's been glassed over plywood a decade or more ago and it is time to redo. I would love to take the ply off and epoxy the seams instead of plywood and glass it.Any thoughts on the success?Doug. How wide are the planks? That is the problem. They need to be narrow. 3 two inch planks are more stable than 1 six inch plank. They need to be dry. Can you saw kerfs into the planks , (if they are wide)? You must paint the decks , preferably white. Anyway, I would not tolerate a carvel deck , so I would do it .They all leak . Over the bunk . Right on your pillow. At night.Then the rain gets in and rots the boat. I re-read this. Lots of fun. What a build! OK, I'm going out to the shop. The Catspaw's not going to build itself. Seems I missed the thread way back when for a good reason. NOW is when I needed the poetry and inspiration that this story gives me. This is the first lesson ye should learn: There is so much good in the worst of us, and so much bad in the best of us, it doesn't behoove any of us to speak evil of the rest of us. @wizbang-- Early in this thread you mentioned that you hate white oak? Did I get that correctly? Why? If youre ever back in Milford, look me up so I can buy you a beer. White oak and epoxy don't get along, and Bruce may as well be Captain Epoxy, or maybe Captain Disc Sander. West System G/flex is formulated to glue woods that are difficult to bond. White Oak is the number one wood mentioned in their spec sheet. For that wood G/flex has your back! I think Wiz's aversion to white oak is around its propensity to rot. I used to own a chandlery business in Falmouth. I met may of these people when they passed through, Paul Johnson, Loulou Magras ( Whose partner came from the Helford River)and others. I believe Terry Heard built a couple of 28 footers, a Canadian friend Glen Cairns had one "Neja" and sailed it back to Canada. Percy Dalton was involved in some of these projects. He was also an Artist, I have some of his paintings on the wall here. When I knew him Paul Johnson always seemed to wear an old military greatcoat. I got the plans for the Venus 28 from Percy Dalton many years ago. There was a foam sandwhich version in Falmouth i came close to buying had i not got laid off work. I know percy drew some of the Falmouth working boats in Ferro, there was an excellent example up in Gweek when i lived there.